I was pretty happy knitting wise when Christmas was over. First because I had finally finished all the Christmas knitting which included two Honey Cowls, three Phoebe Sweaters, one Cardigan for Merry and one Ode to Veera Cowl. 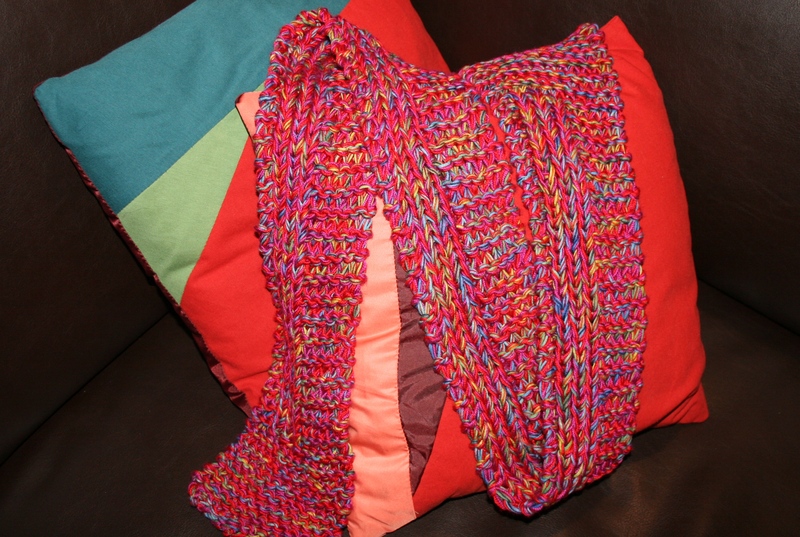 And second because I had not knitted much over the whole Christmas days. So when I came back home I was ready to start something new. 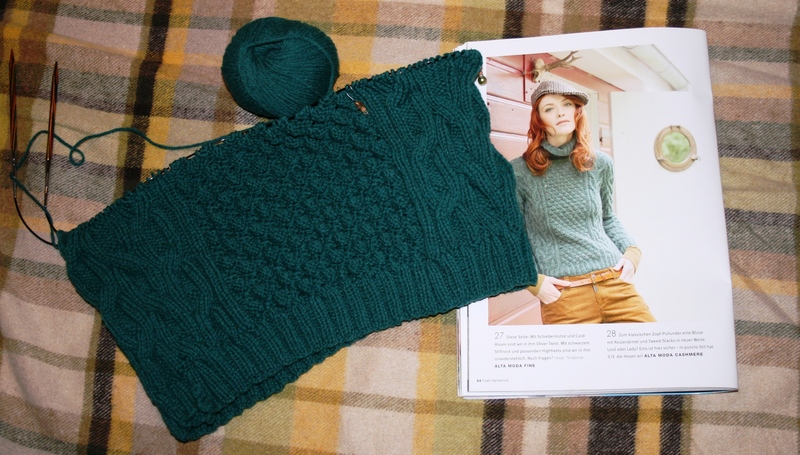 Now I can happily join Ginny’s first Yarn Along of 2014. When I came home the gloves for Michael I had started didn’t really feel right and he told me that sincerly he himself doubted he would actually wear them. And what is the use in putting the effort into knitting gloves with fingers if they will be most likely not worn? So I frogged what was already done and am now looking for a nice hat pattern. Next I rummaged through my stash looking for something I could knit. 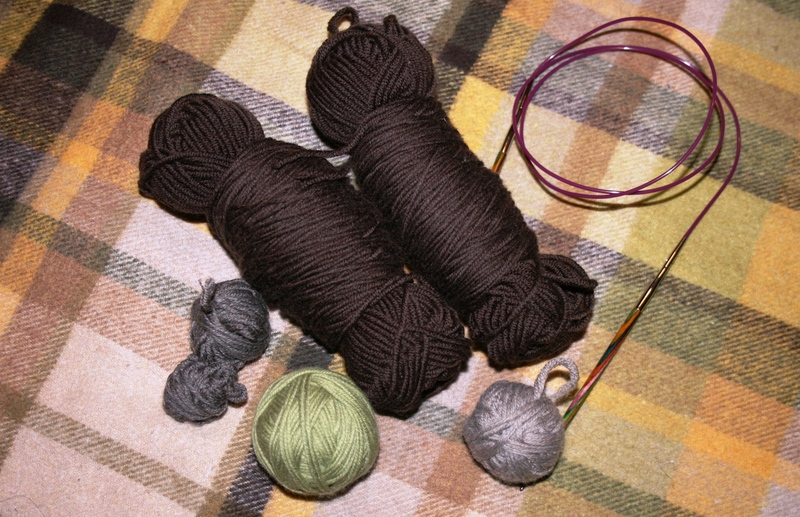 I have enough thin black cotton to knit something for summer, but I didn’t really feel like it yet. I also have some gifted yarn in red that would be enough to make a sweater off, but it didn’t really appeal to me. So I looked for some leftover yarns and started knitting for my Gifts & Charity box. This box gets filled with goodies throughout the year if I don’t know what else to knit or need a small side project. First I took the chunky grey yarn I had already used for my Katniss Cowl. This one was thick enough to be knitted on its own. I made a chunky little cowl out of it in a little more than a day. And when I just finished it, Michael announced he needed a little late Secret Santa gift for a colleague. Now he had already drawn her last year and had given her a hat I made. 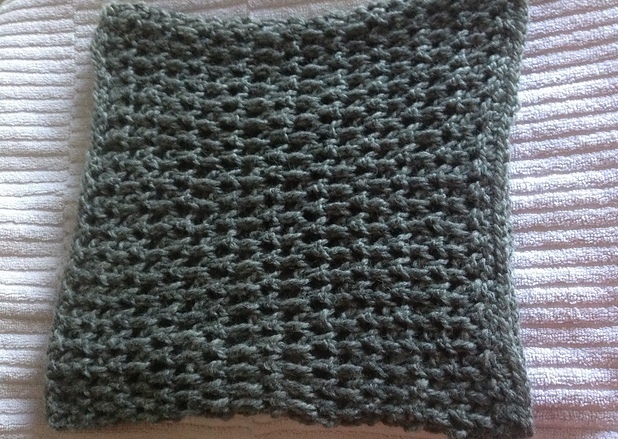 And this was made out of the same grey yarn so it was clear that she would get the cowl. Next I took a thin red and a pink acrylic and paired it with a cool multicoloured yarn because the pairing thing had worked perfectly for the Katniss Cowls and my Secret Santa gift. I had wanted to make the Sweater for Merry out of the multicoloured yarn but then realised, that the first skein I had bought and knitted up first was from a different dye lot and was really totally different in colour (I finally settled for a more manly colour later on anyway). So I looked for something I could make out of just one skein. Out came a kids scarf and it is absolutely soft, squishy and adorable. And it was so quick. The scarf was done within a day! I have enough red and pink yarn left over and of course another 5 skeins of the multicoloured yarn so I might make a scarf or cowl for myself in the same mix soon. Next I used a dark green yarn I inherited from my mum. It might be wool but of the super itchy kind. I paired it with a shiny, soft, dark teal acrylic and a nice turquoise that has gone into the Katniss Cowl and the Ode to Veera shawl already. 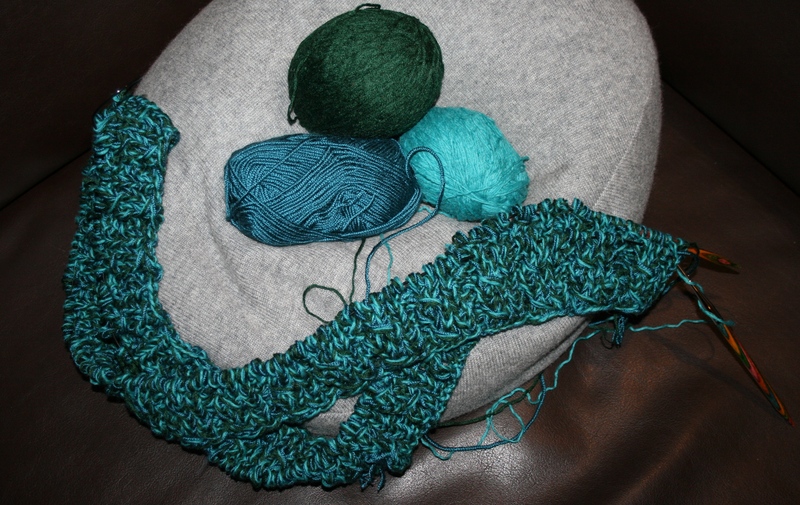 The turquoise yarn must have been a sweater once because there is so much of it. But it is too thin to work with it alone for my taste. And it is quite itchy wool as well. So I’ll probably be pairing it with other yarns for the next years. I guess I could make another whole lot of scarfs and cowls with it. I started a Stockholm cowl with the mix but I didn’t get very far yet because it is over 230 stitches wide and I went yarn shopping on Monday. I had decided to spend my christmas money on some really nice wool for myself. I have never knitted something in wool left alone nice soft squishy merino wool (do I sound a little dreamy?) for myself, except for that shawl. Until last year I didn’t even know that wool could be super soft and not at all itchy. Honestly, I come from a family that obviously always bought horrible wool that was itchy and not very soft and that none of us liked. So I learned knitting with the notion to rather go for cotton or acrylics. But this winter I learned how beautiful merino wool can be. So I went to my LYS (yes, I finally found a place with a super great choice of luxurious yet ok priced wool) and started looking. I knew I wanted to knit something for winter but not too thick. A 4,5 to 5mm needle was what I was aiming for and I remembered that one pattern from a magazine that I had bought last year but had not yet found the perfect yarn for. Now I have found it! It is a Lang Yarn in Merino S160 and it knits up super well! And because I had learned from my last knits that I absolutely hate sewing pieces together I decided to knit the sweater in the round. This works very good so far even though I started several times new. But this was not because of the pattern but because even though my gauge is perfect, the the sweater was a bit loose and I want my sweater to be rather fitted. I will have to see how I can fit in the sleeves without sewing (at least too much) though but I’m sure I’ll find a way. And I’m telling you: the pattern gets a bit demanding in certain rows but I absolutely love it so far. This will be a really cool sweater! 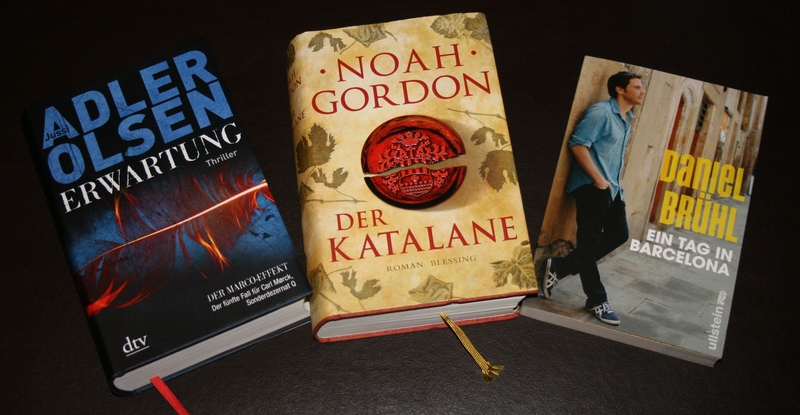 Now to reading: As I said I got several books for christmas. Over christmas I had already finished the “One day in Barcelona” my brother got me and started the new Jussi Adler Olsen book Michael had picked for me in behalf of my SIL. But when I came back I decided to finish “The winemaker” I had borrowed from my parents first. Now I’m as good as through with the Adler Olsen book as well. It is as good as all of them are! And I can’t wait to start with a new one of my christmas presents. And what have you been knitting and reading lately? This entry was posted in Knitting & Crocheting and tagged Cowl, Hat, Katniss, Knitting, Scarf, Sweater, Yarn Along by kathatravelling. Bookmark the permalink. I am impressed by your productivity levels. I’ll be lucky if everyone received their Christmas gift by March! BTW, I love, love, love the Cardigan for Merry. Good thing I have some little nieces and nephews running about. Thank you. But mind you, I started with all that in August. And isn’t the Cardigan for Merry cute? I can’t wait to see it on the little guy who got it even though I think I was very optimistic about the size. He probably needs to grow into it a bit. Ich kann dir meine Methode für Ärmel-ohne-Nähen-dran-schummeln erklären! Das wär super. Ich hätte dich sonst auch ungefähr in zwei Wochen auch gefragt. Ich kann mir das nämlich nur teilweise vorstellen, wie das geht.